Filament Winding at Advanced Composites Inc.
Filament winding creates hollow structures of incredible strength. By cross-weaving continuous rovings of carbon fiber, fiberglass or aramid fiber, and embedding them in a resin matrix, the filament winding process results in an optimized product that is perfect for pressure vessels, aerospace components, golf clubs, military armaments, and hundreds of other uses. Wherever strength is needed at low weight, wherever durability and targeted performance characteristics are imperative, filament winding is the manufacturing process of choice. Three decades of filament winding. For over twenty years, Advanced Composites Inc. has manufactured high-grade composite tubing, aerospace structures and other specialty products with our exacting filament winding process. With a number of filament winding machines and the ability to model, prototype and manufacture at almost any scale, ACI has earned a reputation as a reliable manufacturing partner for any firm needing filament-wound structures. In addition to filament winding, we incorporate compression molding, reaction injection molding and lay-up processes into our production repertoire. Filament winding creates hollow, strong geometries. With our filament winding technologies, Advanced Composites Inc. manufactures carbon fiber tubing, fiberglass tubes, and other hollow structures. These tubes and structures possess excellent tensile strength, circumferential strength, and strength-to weight ratios. The process of filament winding, explained. The filament winding process involves two primary components. A stationary steel mandrel rotates, while a carriage arm travels horizontally up and down the length of the mandrel. The traveling arm includes a winding eye, which groups the rovings—typically of carbon, fiberglass, or a mixture of the two—and dispenses them to the mandrel. As the mandrel turns, the rovings wrap around it to form a composite layer over the mandrel’s surface. The precise orientation of the composite matrix is determined by the rate of travel of the carriage and by the rotational speed of the mandrel, both of which are automated. Before encountering the mandrel, the fibers are impregnated in a resin, which later solidifies with the fiber to create the final composite material. Resin type, fiber type, wind thickness and wind angle are all engineered for product optimization. Filament winding: all about the ELP. A filament winding machine is governed by a computerized numerical control (CNC) unit. When Advanced Composites Inc. engineers develop specifications for a specific filament-wound composite product, they encode them in an engineered layup pattern (ELP), which they load into the CNC. By varying the ELP, even slightly, ACI engineers can build distinct performance criteria into different composite structures, even when those structures contain identical constituent materials. For example, a low winding angle lends greater tensile strength to a product, while a higher winding angle endows the structure with more circumferential strength. In addition to variations on the ELP, we can engineer desired qualities into the product via our choice of filament type and resin type. When we add in the vast array of filament and resin options, our engineers possess incredible latitude to create composite products that meet specific performance criteria. Curing the filament wound composite product. After the layup pattern has been executed, the entire assembly—mandrel plus layer of composite material—is placed in an oven to cure. Our computer-controlled ovens use specific heating profiles to induce cross-linking of the constituent polymer chains into a continuous three-dimensional network. During this process, the composite undergoes an irreversible change and becomes chemically and mechanically fixed. All of the ACI curing ovens feature remote monitoring and redundant data acquisition systems for the tracking and documentation of precise curing protocols. When the composite resin has fully cured, we extract the mandrel, leaving the hollow composite structure. 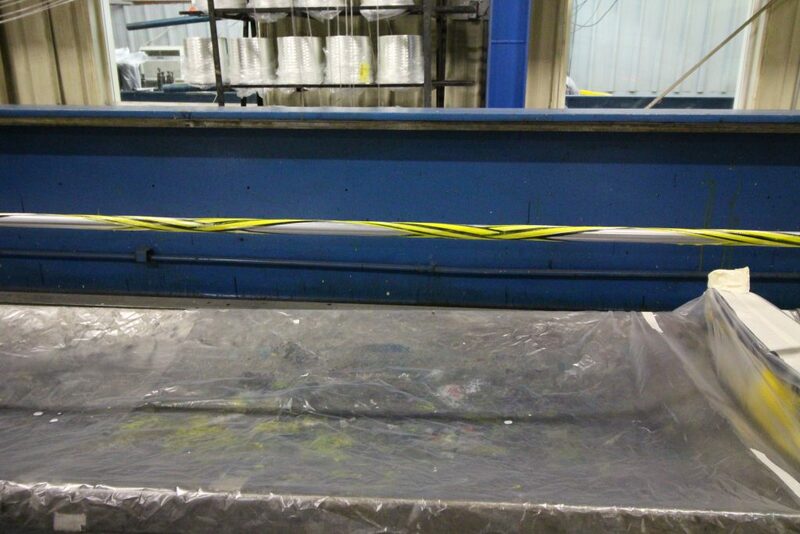 Advanced Composites operates six filament winding machines in two work shifts. Four of these machines are large, capable of winding composite structures up to 32′ in length and 48″ in diameter. Another filament winding machine is ideally suited for quick turnaround prototype runs up to 12′ in length. A sixth unit is multi-spindle, and is also perfect for quick turnaround structures up to 20′ in length. All filament winding machines have computerized numerical controls (CNC) that allow the automated layup pattern to be executed free of human error. Advanced Composites also maintains a large inventory of mandrel tooling to accommodate an extensive range of composite projects. In the event that ACI lacks the proper mandrel for a given design, it can be quickly produced. For further information on overall ACI infrastructure and capabilities, please see our Facilities page. Because a filament wound tube or other filament wound geometry is hollow, it tends to be extremely lightweight, without sacrificing strength. In many applications, weight is almost as important as strength. For example, aerospace and defense technologies need to be as light as possible while retaining strength, and filament wound composite components can best achieve the target strength-to weight ratios. By creating such lightweight composites, filament winding saves transport and shipping costs as well. Filament winding is rapid and is highly automated. Since the Engineered Layup Pattern directs the pattern of the filament wound composite matrix, little room is left for human error. While Advanced Composites Inc. technicians attend a filament winding machine, performing an overseeing and supporting role, the spools, mandrel rotation carriage—all of which are controlled by the ELP—perform the crucial aspects of the filament winding work. No dry winding at Advanced Composites Inc. Many filament winding shops perform dry winding, which utilizes off-the-shelf towpreg composite fabrics. These have been manufactured to have resin and fiber in one package. In other words, the fibers have been impregnated with resin by the towpreg manufacturer, hence another term for the product: prepreg. Rather than using towpreg in our filament winding process, Advanced Composites Inc uses fiber rovings in their raw form. We purchase these rovings in bulk. These filaments pass through a resin bath en route to the wind eye, hence the term wet winding. Our filament winding resins have been formulated by Advanced Composites Inc. engineers to have optimal properties for each application for which we wind. Cost savings of filament winding wet is great. Using raw materials, as we have noted, allows ACI engineers to customize a performance profile that matches product specs exactly. Additionally, our bulk purchasing of filament and resin allows us to control costs for our customers. Advanced Composites Inc: more than filament winding. Though Advanced Composites Inc. does more filament winding than by all other production methods combined, it still has a robust infrastructure for compression molding, lay-up and reaction injection molding methods of composites manufacture. Read more about these various techniques for producing composite structures on their respective pages.